Different rooms have different needs when it comes to using an electric heater. A utility heater fit for heating a garage won’t look as nice, nor work as well in a formal dining room. A sleek and small tabletop heater for an enclosed office won’t heat a high-vaulted living room. Choosing the right heater largely depends on the room where you plan to use it the most. Here’s a room-by-room look to help you decide on the right heater for your unique space. Noise is also an important consideration for portable heaters. These are rooms where there’s a lot of activity, binge watching, and lively entertaining, so you’re going to want something that’s quiet. While ceramic heaters tend to be very quiet, a Silent Room Heater is a low-profile baseboard-style heater that does not use fans to circulate heat, and is going to be totally silent. Color and style are also important factors in choosing portable heaters for a living room or family room. Check out a stylish Designer Series Heater or a modern Bladeless Heater to find a match to your existing décor style. It’s the heart of the home. Kitchens may be warm when cooking, but cool down quickly when it’s time to actually enjoy the meal. A heater for the kitchen needs to be stylish enough to suit your décor, but also small enough for the space. Try a space efficient heater, such as a sleek Ceramic Tower Heater, or one that sits comfortably on the tabletop or countertop. Noise is also a factor to consider with a kitchen heater. No one wants to shout over the noise of the heater to talk during a meal. Try a Bladeless Heater, which is ideal for quiet conversation, or opt for a remote-controlled device like the 30″ Digital Space-Saving Ceramic Pedestal Heater with Digital Remote or the Full-Circle Warmth Ceramic Heater to quickly and easily turn the heater off when chatting or when turning up the heat on the stove. Space considerations and energy savings top the list of desirable features for electric heaters in a home office. These tend to be smaller rooms, so a space-saving unit is essential. Portable heaters in home offices are also bound to get a lot of use, so choosing an energy-efficient model will help your energy budget. A personal-sized heater, such as the My Heat® model in a stylish black, white, purple, or blue, fits right on your desk and uses a lower wattage to save on energy. A smaller tower heater or a compact heater are also good choices for a home office. Set the mood for relaxation. The bedroom needs a heater that is chic but powerful, functional but space-conscious, and quiet so you can relax and enjoy your bedroom sanctuary. The Ultra Ceramic Fireplace Heater looks like a roaring fire and adds instant ambiance and soft lighting to your sleeping space. The Electronic 34″ Ceramic Tower Heater with Logic Center Remote Control offers multiple quiet heat settings and a programmable thermostat to make sure the room stays the perfect temperature. Any remote-controlled heater is great for the bedroom; stay under the covers and simply use the remote to turn off the heater before falling asleep. 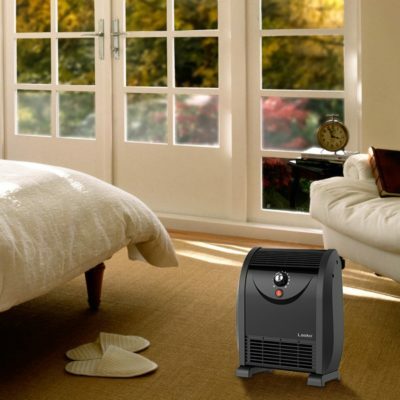 A bedroom heater should also be designed so that the heat is elevated and directed toward the bed, not the floor. A tabletop heater atop a dresser is also a good choice, or try a slim pedestal heater to circulate warmth where you need it most. Utility heaters for your basement, craft room, or garage need to be sturdy, portable, and easy to use. These factors are more important for this type of heater than style, color, or fancy features. You want to be able to carry your heater around from project to project, so a large handle is ideal. You’ll also need it to be durable enough to stand up to all that moving around. It needs to be easy to use and powerful enough to quickly heat your space so you can get to the task at hand. Try a Pro-Ceramic Utility Heater known for its rugged, durable construction, or a Ceramic Utility Heater with Adjustable Thermostat that comes with an easy-grip carry handle to move it with ease. Unplug your heater when not in use; don’t just turn it off. Never leave the heater unattended, especially around children and pets. Plug the heater directly into the outlet; don’t use an extension cord, a power strip, surge protector, multiple outlet adapter, cord reel, or outlet-type air freshener. Only place your heater on a dry, flat surface. Never run the heater power cord under carpeting, throw rugs, or similar coverings. Keep the front of the heater at least three feet away from walls, furniture and draperies, as the heat exhaust area can become hot when in use. Carefully consider your heater and room needs before you shop and review the variety of heaters on the market. With the right heater, you’ll not only stay toasty warm this winter season, but you’ll likely save on your energy bills, too. Comfortable Living News … brought to you by Lasko Products, LLC, leaders in innovative, quality, high-performance home comfort products at a great value. What’s the Best Temperature to Set the Thermostat in Winter? What Are the Best Fans for College Dorms? How Much Energy Does a Space Heater Use? How Much Energy Does a Fan Use?